Do a happy dance because it’s the freaking weekend!! Whoo hoo! · I’m always looking for new ways to sneak alcohol into sporting events. Enter the flask SEAT CUSHION. Seriously, why didn’t anyone think of this sooner!??! This allows you to sneak in way much more than a flask or wine jugs! · Celebrity first dance songs via the Daily Mail – one is very ironic. · THANK YOU Mod Cloth for making my Friday more bright with photos from one of my all-time favorite movies – Troop Beverly Hills. And ONE EXTRA one from Cup of Jo – seriously. How did I NOT learn this in college?! 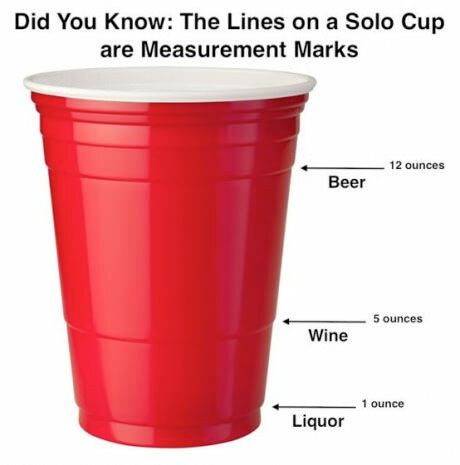 The meaning of the lines on your Red Solo Cup. Mindbottling.